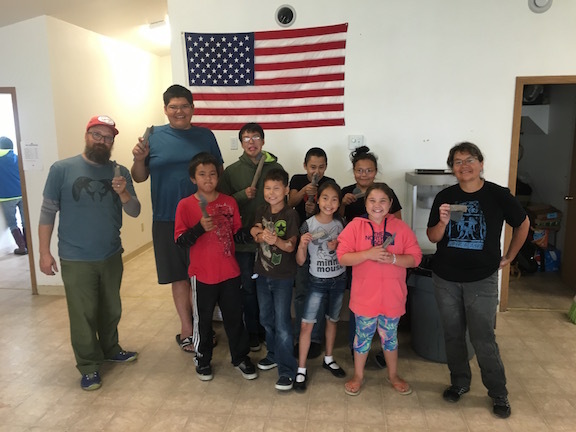 Last week I traveled to the villages of Nondalton and Newhalen on the Alaska Peninsula as part of Lake Clark National Park & Preserve's youth day camp program. In each village, National Park Service (NPS) staff and I had a blast with the kids doing a variety of activities. 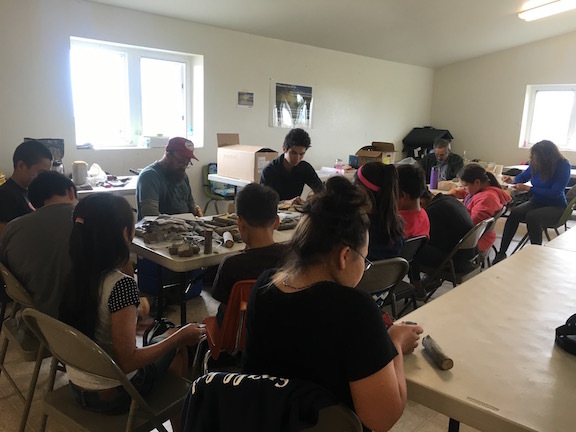 My part in the day camps consisted of working with older kids on making traditional slate spear points, knives, and ulus/vashlas similar to ones found in ancestral Alutiiq, Dena'ina, and Yup'ik archaeological sites. Ancestral Alutiiq, Dena'ina, and Yup'ik made and traded slate tools for thousands of years on the northern Alaska Peninsula and elsewear. 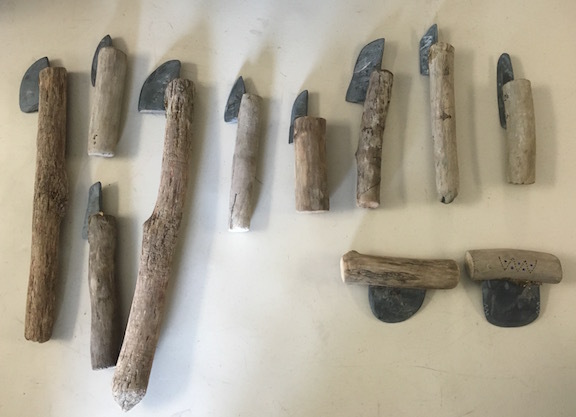 To prepare for the day camps, I needed to make around 50 roughly-shaped ground slate tools to ensure the kids had plenty to choose from and to replace the ones that broke while making them. Check out the slideshow to see how I did this so you can do it and to see how the day camps went (SPOILER! It went great!). To efficiently make a bunch of tool blanks, I started with two slate floor tiles kindly donated by Rino's Tile and Stone to make the spear points and knives. Slightly into the project, I realized the kids may want to make ulus or vashlas. 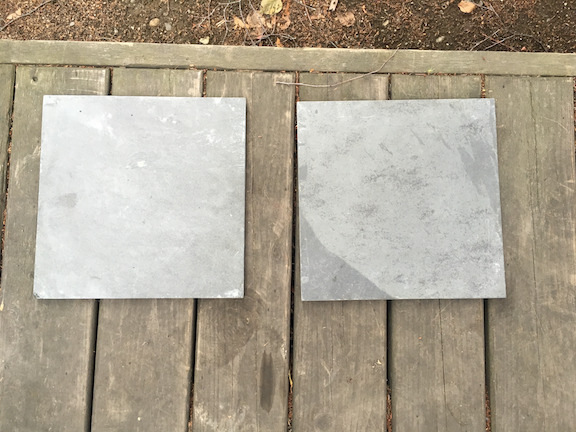 I had already cut the two tiles and was ahead of schedule so I got some raw slate from Anchorage Sand and Gravel. They have raw slate from the Hope area on the Kenai Peninsula,which is cool. After talking with the State Archaeologist, I also looked at using shale. My friend Ross, my son, and I headed out west of Chickaloon and collected some shale along the roadway next to the Matanuska River. Here are some of the initial tool patterns on slate tile and raw shale blanks. Initially, I was going to go for longer knives but decided to get two knives out of each blank. To cut down on the grinding, I decided to split about a 1/4" off the thickness of the slate tile blanks (My wife Katie actually did most of the splitting. Thanks! I love you!). After a bit of trial and error and some internet research, I realized my failing, bench grinder with a stone for grinding metal would not work. Luckily, I found a bench grinder for sale on craigslist capable of wet & dry grinding. Some helpful advice from Nature's Jewels Rock Shop and Lapidary pointed me towards a silicon carbide grinding stone, which I got at Grainger's. Driftwood seemed to be the most reasonable tool-handle material. It is easy to work with, plentiful nearby, and free. Everything easily fit on the bike for the ride home. 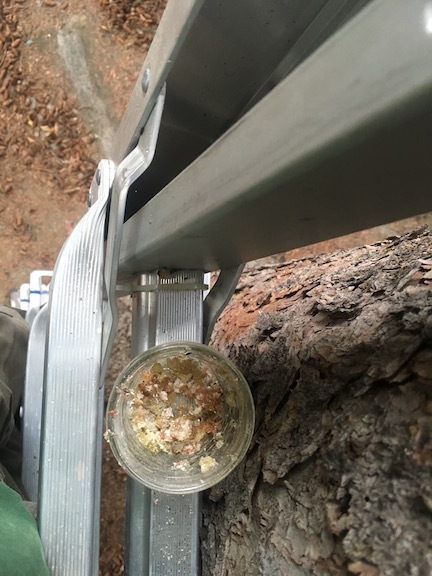 People in the area have been using spruce sap as glue for thousands of years because it works well and you don't have to go far to harvest it. I collected the clear, yellow, and brown sap from spruce trees in our yard, my friends' yards, the yards of their neighbors. I also dropped the jar twice. Picking sap chunks out of fallen spruce needles is a humbling task. The Evanoff family was kind and let me stay at their fish camp on the Newhalen River. It is an amazing place. Thank you! Here's some of us working on our slate tools at the NPS youth day camp in Nondalton. Adults and kids turned out to grind some slate! This wood groover I got at the Anchorage House of Hobby proved invaluable for starting straight grooves in which to insert the blades. I finished the grooves with a Dremmel tool due to time constraints. 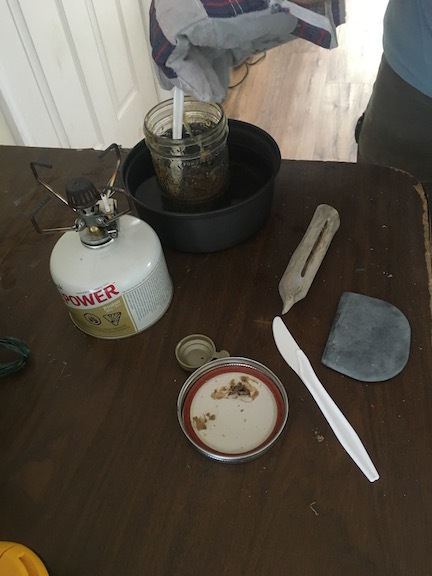 At the day camps, I used a camp stove to heat the spruce sap to liquefy it. A plastic knife works well for getting the spruce sap glue into the groove of the driftwood handle. A thin stick would also work great. We found the blade sometimes fits a little better in the groove one way more so than the other. Once things are lined up, just squeeze them together. Be sure you are wearing gloves, because the sap is hot and the blade edge may be sharp depending how well you sharpen it. 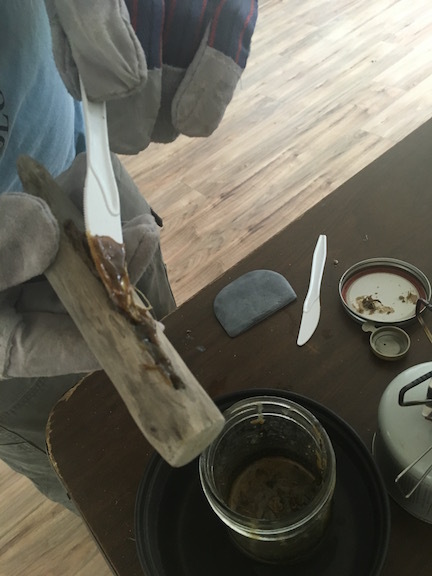 Once that sap dries, the blade is set! This is Colleen's finished ulu. She did a fantastic job grinding, shaping, and sharpening the blade. Here are some the traditional slate tools made at the Nondalton youth day camp. Here's some of us showing off the slate tools we made! Things are all laid out and ready for the Newhalen youth day camp. Adults and youth turned out for the day camp and a lot of them ground some slate! The Campfire program leaders even joined in. Here are some of the slate tools we made in Newhalen! The driftwood for the two long handled knives was collected from the shore of Sixmile Lake. Some of the camp showing off their work! I'll stress to you as I stressed to the kids, don't worry if the tool breaks while working on them. Your ancestors and everyone else's were breaking tools since time immemorial. The archaeological record is full of tools people broke while making or using them! The beauty of slate is that you can just keep grinding on it to reshape the broken part. 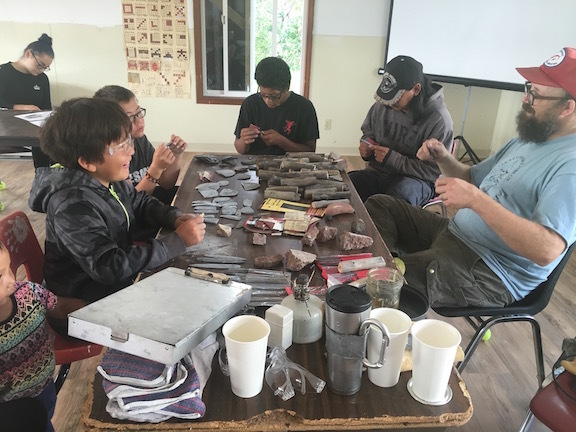 Let Cultural Alaska know if you would like to arrange a slate grinding class for the youth of your tribe, community, or organization. Not interested in slate? No worries, Cultural Alaska has a lots of options for youth education and outreach.